It is a BEAUTIFUL day outside today! It's not too hot, not too cool. I went out to check on the greenhouse after picking up my son from Preschool. When it's sunny outside, regardless of the temperature, the greenhouse can be 130 degrees. That's not good for all of those little sprouts inside. So hubby has hooked up this window fan we bought at the MOMS Club garage sale last year to blow that hot air out the roof vent. To my surprise, when I checked the temp it was only 70 degrees in there. So I guess the fan is working well. 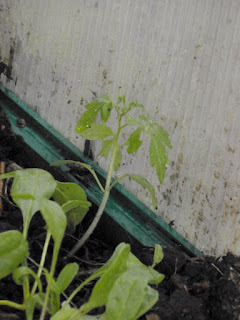 I also noticed while I was in the greenhouse that some of the seeds I just threw on the ground in the corner are sprouting and growing pretty well. Looks like I've got 2 zucchini, some chard, lettuce, and (drumroll please.....) 6 tomato plants growing on the ground in the greenhouse! The ones I lovingly planted and tended in the pots are barely doing anything, but the ones that I just tossed wherever are gr owing like crazy! I guess as long as they're growing, I shouldn't care where they grow, right? I think I may need to start a few more butternut squash; only 2 of the 8 seeds I planted have sprouted, and I'd like more than 2 plants. But my rutabaga has sprouted and a few more pumpkins have come up, too. As son and I walked around the yard, I noticed that a few more of the potatoes that I planted wherever I could find a bit of dirt are sprouting. I won't be able to cover them with a mound of dirt like I'd like to, but they should produce a few potatoes, anyway. And the bush beans that the kids planted are doing pretty well. 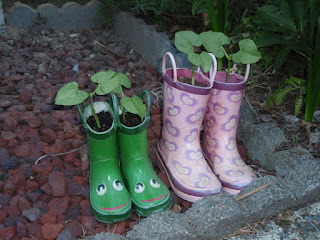 They each planted a bean plant in their old rain boots from last year. They look pretty cute. I'll have to post a picture of them on here. Isn't blogging fun? At first I thought your blog was called Angie's Sunburn Oasis. That would be ironic. Anyway, good to see your blog. Fun, fun. People who spoil things are so annoying!